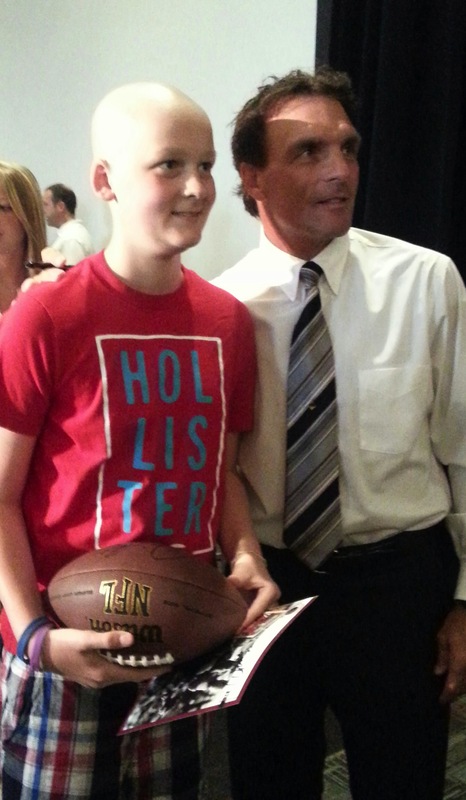 With the help of the Charlotte Touchdown Club, Dream Kid BJ Correll was able to receive signed memorabilia and meet Doug Flutie earlier this year! 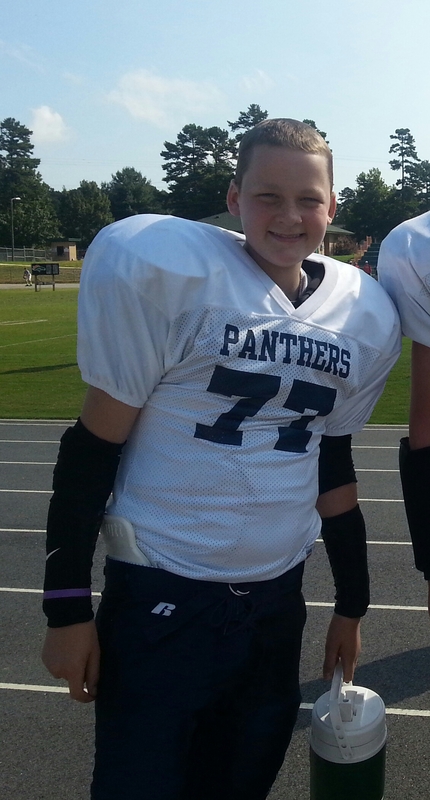 In the fall of 2012, 12 year old BJ Correll was playing football for Boger City Optimist Club in Denver, NC. His mother noticed that after practice and athletic conditioning training, BJ seemed to struggle much harder to recover than most of the other kids. His mother talked to coaches and teachers to find out what they were seeing and what may be going on. In September of 2012, BJ’s mother decided that it was time to visit the hospital. After several tests and blood work, the doctor informed Michelle and BJ that he was battling leukemia. BJ began a series of treatments at Levine Children’s Hospital. His best friend has been by his side through this process and hangs out with BJ on days when the treatments take their toll on him. BJ does not view himself as a victim, but instead has chosen to fight this disease with a positive attitude and all of his strength. BJ is now doing much better! His is back to playing football and has his hair back. Go BJ! Katy Wind, along with Angela Miller and Elizabeth Gray, works at Novant Health here in Charlotte. They are part of an amazing team that connected us with our most recent Dream Kids, Zasheed and Zebulon McNeal. Their team has worked with the McNeal family for many years. Katy, Angela and Elizabeth woke up well before the sun last Tuesday to help send the McNeal brothers off on their Dream Experience. In the moments leading up to the surprise, they spoke of the McNeal family and how deserving they are of a Dream Experience like this one. They reminisced on the years they’ve spent with the family and were so excited for them. The three also came bearing signs and smiles to welcome the McNeal family home Wednesday afternoon. The selflessness and compassion they put into their work everyday is awesome and we thank them for it! Without people like them, DO3 Dream Experiences would not be possible. We cannot thank the Novant Health team enough for everything they did to make this Dream Experience happen! I love my job. But on Dream Days in particular, I truly feel like I have the best job in the world! Ever since I watched my first episode of Extreme Home Makeover, my dream job has been to be Ty Pennington and get to say “welcome home ___ family, welcome home.” On Dream Days, I get to be Ty! Dream Day is the culmination of months of preparation, planning, and unfortunately a little bit of stress. The goal is to gift our Dreams Kids and their families with an unforgettable experience, without them having to worry about a thing. Sometimes that works, and sometimes it doesn’t. However, the one thing that we can count on every time is something that we at Dream On 3 refer to as…Dream Mojo. Dream Mojo is just our fun way of referring to God’s blessings on Dream Day. It can show up in the form of an unexpected interaction with a celebrity, an unplanned upgrade at the airport or hotel, or a priceless reaction from one of our Dream Kids caught on camera. For me, this is the most exciting thing about Dream Day. We get to see how He is going to apply His signature on His artwork. We’re on the plane heading home from New York, exhausted from the whirlwind tour the day before. My body says “SLEEP” but I don’t want to risk forgetting yesterday’s Mojo. It started at 5:30am. I can still see Zebulon and Zasheed’s reactions when their child life specialists exploded out of a stretch limo carrying behind them a red carpet! DO3 can schedule it, but we can’t manufacture a moment like that! The most unbelievable Mojo moment was when I stepped up to the ticket counter to print our boarding passes only to learn that our entire group was sitting together….in first class! “WHAT!” As much as I would love to say that we had something to do with that, we didn’t. Imagine if your first time in an airplane was in first class! I’m stretched out in an oversized seat answering questions like…“what’s going on with my ears? What do you mean they’re going to pop? Are those clouds or a blanket of cotton? Is all of this food free?” I just smiled and knew that He had done it again. The entire day was full of little moments like these. When we pulled up to the MLB Fan Cave, Tonique told me that we had left Zebulon’s diapers at the hotel. As we were debating fighting NY city traffic and heading back, we looked across the street and saw a Pharmacy that just happened to carry his size diapers. Everywhere we went the boys were showered with gifts and autographed memoribilia! It was like Christmas morning. We experienced this all day long, but funniest story came at dinner time. Prior to the trip, Elizabeth had called and asked “what kind of food do the boys like to eat?” You can imagine our surprise to learn that their favorite foods were “steak, lobster tails, and shrimp.” Secretly, our budget more closely resembled a menu of hot dogs, pizza, and Lucky Charms. Elizabeth replied, “well, we’ll see what we can do.” I remember replying to her in the most respectful manner, “ARE YOU CRAZY? That was not the right response!” So what happened? 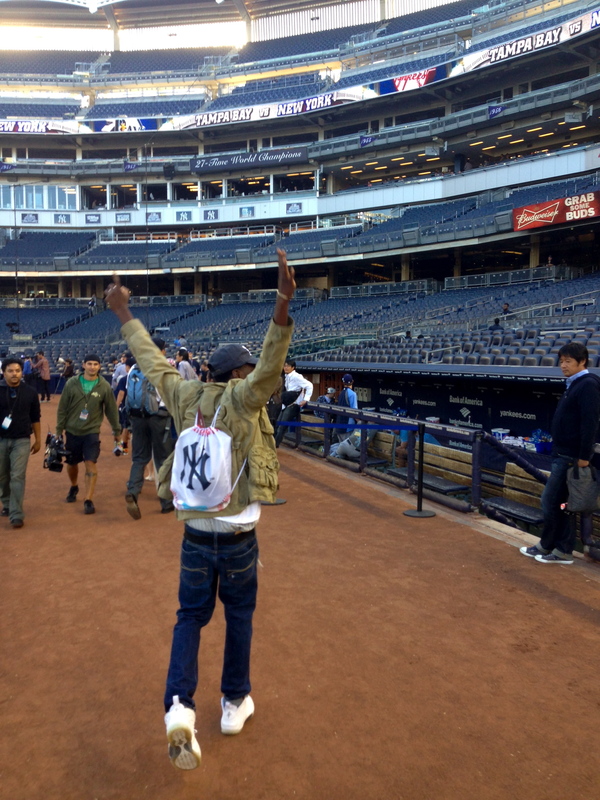 After our time on the field, the entire McNeal family was invited to dine in The Legends Club at Yankee Stadium. They were told that in the Legends Club it is “all you can eat and drink.” And on the menu for the evening….you guessed it! “Please help yourself to all the steak, lobster tail, and shrimp you can eat” said the representative from the Yankees. Now how’s that for some serious MOJO! Over the last 36 hours, the McNeal family has thanked us no less than a billion times. It warms our hearts to know that this gift was received as it was intended and will be a day that they will never forget. However, as is always the case…the true blessings fell on those of us that got to play a small role in making these dreams come true! Welcome home McNeal family, welcome home.